A drumlin, from the Irish word droimnín, first recorded in 1833, and in the classical sense is an elongated hill in the shape of an inverted spoon or half-buried egg formed by glacial ice acting on underlying unconsolidated till or ground moraine. A cinder cone is a steep conical hill of loose pyroclastic fragments, such as either volcanic clinkers, cinders, volcanic ash, or cinder that has been built around a volcanic vent. They consist of loose pyroclastic debris formed by explosive eruptions or lava fountains from a single, typically cylindrical, vent. As the gas-charged lava is blown violently into the air, it breaks into small fragments that solidify and fall as either cinders, clinkers, or scoria around the vent to form a cone that often is symmetrical; with slopes between 30–40°; and a nearly circular ground plan. Most cinder cones have a bowl-shaped crater at the summit. A complex volcano, also called a compound volcano, is mixed landform consisting of related volcanic centers and their associated lava flows and pyroclastic rock. 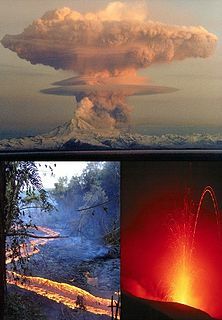 They may form due to changes in eruptive habit or in the location of the principal vent area on a particular volcano. Stratovolcanoes can also form a large caldera that gets filled in by a lava dome, or else multiple small cinder cones, lava domes and craters may develop on the caldera's rim. A bornhardt is a dome-shaped, steep-sided, bald rock outcropping at least 30 metres (100 ft) in height and several hundred metres in width. They are named after Wilhelm Bornhardt (1864–1946), a German geologist and explorer of German East Africa, who first described the feature. A cuesta is a hill or ridge with a gentle slope on one side, and a steep slope on the other. In geology the term is more specifically applied to a ridge where a harder sedimentary rock overlies a softer layer, the whole being tilted somewhat from the horizontal. This results in a long and gentle backslope called a dip slope that conforms with the dip of resistant strata, called caprock. Where erosion has exposed the frontslope of this, a steep slope or escarpment occurs. 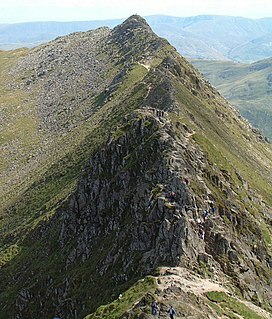 The resulting terrain may be called scarpland. A dome is a feature in structural geology consisting of symmetrical anticlines that intersect each other at their respective apices. Intact, domes are distinct, rounded, spherical-to-ellipsoidal-shaped protrusions on the Earth's surface. However, a transect parallel to Earth's surface of a dome features concentric rings of strata. Consequently, if the top of a dome has been eroded flat, the resulting structure in plan view appears as a bullseye, with the youngest rock layers at the outside, and each ring growing progressively older moving inwards. These strata would have been horizontal at the time of deposition, then later deformed by the uplift associated with dome formation. A conical hill is a landform with a distinctly conical shape. It is usually isolated or rises above other surrounding foothills, and is often, but not always, of volcanic origin. An inselberg or monadnock is an isolated rock hill, knob, ridge, or small mountain that rises abruptly from a gently sloping or virtually level surrounding plain. In southern and south-central Africa, a similar formation of granite is known as a koppie, an Afrikaans word from the Dutch word kopje. If the inselberg is dome-shaped and formed from granite or gneiss, it can also be called a bornhardt, though not all bornhardts are inselbergs. A Kuppe is the term used in German-speaking central Europe for a mountain or hill with a rounded summit that has no rock formation, such as a tor, on it. A range of such hills is called a Kuppengebirge. 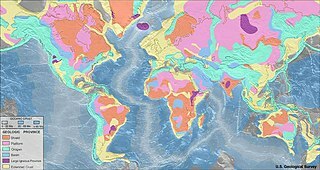 In geology the term also refers to corresponding stratigraphic forms. The term is similar to the English topographical and geological terms, knoll and dome. It is similar to the French word ballon which means a mountain with a rounded summit. Volcanic cones are among the simplest volcanic landforms. 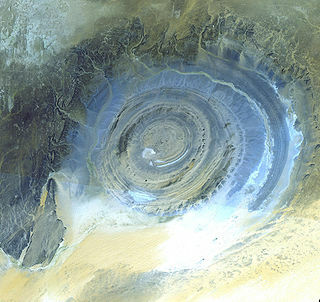 They are built by ejecta from a volcanic vent, piling up around the vent in the shape of a cone with a central crater. Volcanic cones are of different types, depending upon the nature and size of the fragments ejected during the eruption. Types of volcanic cones include stratocones, spatter cones, tuff cones, and cinder cones. Indian Heaven is a volcanic field in Skamania County in the state of Washington, in the United States. Midway between Mount St. Helens and Mount Adams, the field dates from the Pleistocene to the early Holocene epoch. It trends north to south and is dominated by six small shield volcanoes; these shields are topped by small spatter and cinder cones, and the field includes a number of subglacial volcanoes and tuyas. The northernmost peak in the field is Sawtooth Mountain and the southernmost is Red Mountain; its highest point is Lemei Rock at an elevation of 5,925 feet (1,806 m). The Spectrum Range, formerly called the Spectrum Mountains and the Rainbow Mountains, is a subrange of the Tahltan Highland in the Stikine Country of northwestern British Columbia, 20 km west of the Stewart-Cassiar Highway, south of Mount Edziza and north of the Arctic Lake Plateau. The Spectrum Range falls within Mount Edziza Provincial Park. The range is lightly glaciated, as compared to the other ranges to the west. It is accessible only by foot or via helicopter; there are no roads to the range. The Itcha Range, also known as the Itchas, is a small isolated mountain range in the West-Central Interior of British Columbia, Canada. It is located 40 km (25 mi) northeast of the community of Anahim Lake. With a maximum elevation of 2,375 m (7,792 ft), it is the lowest of three mountain ranges on the Chilcotin Plateau extending east from the Coast Mountains. Two mountains are named in the Itcha Range; Mount Downton and Itcha Mountain. A large provincial park surrounds the Itcha Range and other features in its vicinity. More than 15 animal species are known to exist in the Itcha Range area, as well as a grassland community that is limited only to this location of British Columbia. The Itcha Range resides in the territory of aboriginal peoples who have occupied this region for centuries. This area has a relatively dry environment compared to the Coast Mountains in the west. In volcanology, a pyroclastic shield or ignimbrite shield is an uncommon type of shield volcano. Unlike most shield volcanoes, pyroclastic shields are formed mostly of pyroclastic and highly explosive eruptions rather than relatively fluid basaltic lava issuing from vents or fissures on the surface of the volcano. They typically display low-angle flank slopes and often have a central caldera caused by large eruptions. Lava is commonly extruded after explosive activity has ended. The paucity of associated Plinian fall deposits indicates that pyroclastic shields are characterized by low Plinian columns. West Crater is a small lava dome with associated lava flows in southern Washington, United States. Located in Skamania County, it rises to an elevation of 4,131 feet (1,259 m), and forms part of the Cascade Volcanic Arc. It is also part of the Marble Mountain-Trout Creek Hill volcanic field, a little-known Quaternary volcanic field in the southern Cascades of Washington state. 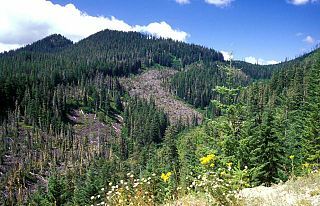 The area can be hiked, and can be accessed by roads in the Gifford Pinchot National Forest. A volcanic plateau is a plateau produced by volcanic activity. There are two main types: lava plateaus and pyroclastic plateaus. Volcanology of Western Canada includes lava flows, lava plateaus, lava domes, cinder cones, stratovolcanoes, shield volcanoes, greenstone belts, submarine volcanoes, calderas, diatremes and maars, along with examples of more less common volcanic forms such as tuyas and subglacial mounds. ↑ Lidmar-Bergström, Karna (1995). "Relief and saprolites through time on the Baltic Shield". Geomorphology . 12: 45–61. doi:10.1016/0169-555X(94)00076-4 . Retrieved 27 July 2015.